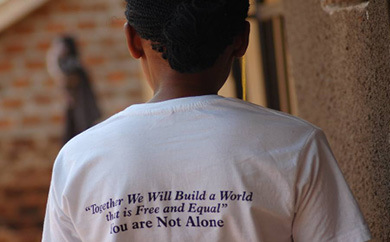 Triumph BI East-Africa was founded in 2011 by a group of bisexual women and focuses on the fight for equal rights for bisexual women and men, as well as LGBT people in general. In 2013, Triumph BI East-Africa even organized a bisexual pride event. In Uganda’s society, there is a lack of knowledge about bisexuality. Bisexual women are often threatened, victims of violent attacks, and loose custody of their children after their environment learns of their sexual preference. Triumph BI East-Africa supports this vulnerable group with counseling services and training. Additionally, they organize advocacy workshops for local (spiritual) leaders and health workers, in order to create understanding and acceptance. An educational brochure has been developed.